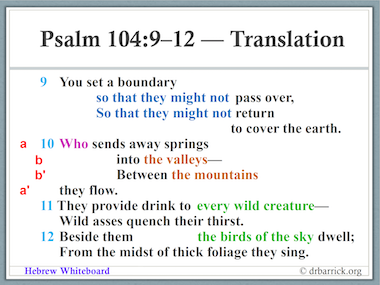 Completing the first third of Psalm 104, our analysis takes another distinct turn in its point of reference: the topic becomes the ongoing natural order of the earth as determined by its Creator. If, however, we are correct in understanding Psalm 104:6-9 as a reference to the Flood of Noah’s day, we must also see God as Judge and King–thus His strong “rebuke” in Psalm 104:7. But, Psalm 104:10-12 (included in this update) reveals that God also restores, beautifies, and provides for the post-Flood world. An apt line comes to mind from Isaiah 61:3, “To give them beauty for ashes” (NKJV). And, what better way to describe beauty than to use beautiful Hebrew poetry? Click on Hebrew Whiteboard to download Psalm 104:1-12 or any of the previous studies of Psalms 1-6 and 120-122.